Plus a warning to novices,only days before the market corrected. The authors write; "Experienced traders and investors understand that market and personal psychology, coupled with sound money & risk management are often far more important than the stocks you buy…..It is not all about finding the holy grail indicator, wading through company reports or analysts’ data. Those who win in the market long term are those who do not become sucked in by the ‘irrational exuberance’..."
This Ebook aims to help you protect yourself & avoid some major pitfalls in the stock or share market. The warnings Jim's Report Members received in Dec.2007 i.e. BEFORE the savage falls in 2008. 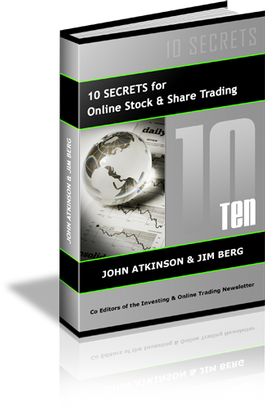 Take control of your financial future now and learn the 10 Secrets to Profitable Online Stock & Share Trading.